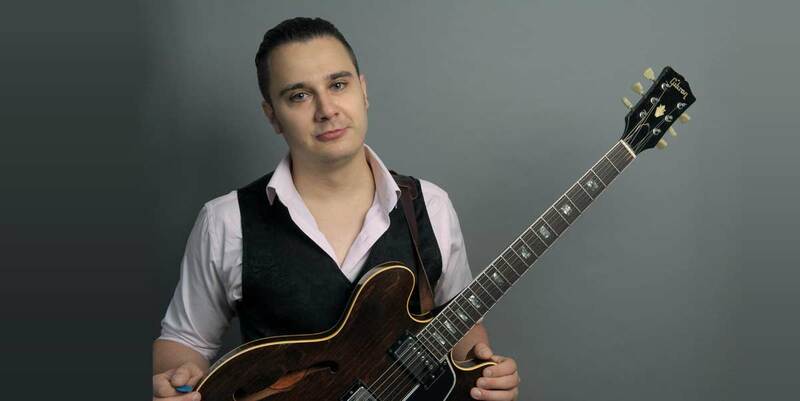 New York City based guitarist/composer/producer Andy Bianco graduated from the Berklee College of Music with a degree in Performance. He has performed/recorded with Angie Stone, Onree Gill, Ray Chew, Elle Varner, Bob Moses, Mauro Pagani & many others at such renowned venues as Smoke Jazz Club, The Zinc Bar, The Bitter End, The Blue Note, SOB’s, Joe’s Pub, Billboard Live Osaka/Tokyo, The Howard Theater, The 2013 Long Beach Jazz Festival, The 2014/2015 Essence Festival in New Orleans, The 2014 BET Awards, & he’s also the guitarist for the Grammy nominated RnB artist Elle Varner, with whom he’s completed a tour of Japan for Billboard Live. He was a finalist in the 2012 & 2015 USA Songwriting Competition, & his 2 official album releases as a leader have received domestic & international critical acclaim from Elsewhere New Zealand, Bop-N-Jazz, The New York City Jazz Record, & other publications. Andy performs his original jazz compositions as a leader & with other groups at such NYC jazz hot spots as Smoke Jazz Club, The Zinc Bar & Fat Cat & he has completed a 6 month tour of New Zealand & Japan as the guitarist with the critically acclaimed stage production entitled, “Empire.” He teaches privately & in group settings & has been a faculty member at the Berklee College of Music Summer Guitar Sessions.